I looked forward to reading “ScrewDat: a Take It Down The Road” by Joe Les, as I love reading fun anecdotes, which is the impression I got from the back cover of the book. However, I did not find this book was an anecdotal book at all…although it does have a unique sense of humor. The author compiled a collection of short stories (which he classified as anecdotes, but that to me were more like social idioms of our society), and structured it in vignettes which painted a common social expression most of us repeat in our day to day conversations. Such as Going Postal, None Of Your Business, Everything Happens For A Reason; or social prototypes and situations such as: Ill-Mannered, Cell Phone Folks, Phony Apologies, Hypocrisy, and Rumor/Gossip, just to name a few. The author presents his take on these things to the reader through each vignette with a cynical sense of humor and an I-don’t-care-about-that attitude, as suggested by the title. Joe Les’ writing style has a stand up conversational kind of feeling. His voice comes through consistently throughout the book, and even though each vignette can be read in any order, the way he organized them did flow perfectly. Having said that, I was not a fan of the ‘screwdat and peep’ repetition in each vignette, and I also found some misspellings, some of which seemed to purposely note slang, but other misspelling and grammar issues did throw me off enough to bother me. Les was successful in creating a visual with his narrative, and I was able to relate to the situations as I have found myself in many. I believe that I would have related better to them, had it not been for the repetitive ‘screwdat and peep’ popping up all along. I guess the voice of the narrator is so defined that the reader will either like it or not…the stories described under a well-defined narrator’s voice could be a turn-on or a turn-off for the reader depending whether the audience likes or dislikes the narrator’s personality. Under that concept, the repetitive expressions were a turn-off to me, which hurt my ability to connect with the narrator. 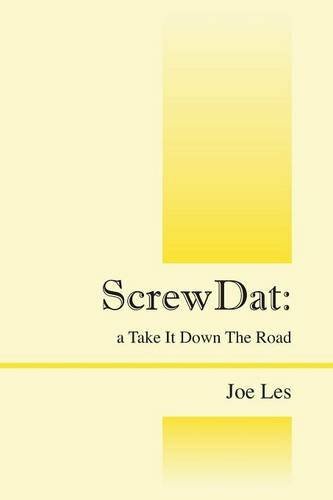 Nevertheless, I believe “ScrewDat: a Take It Down The Road” by Joe Les does have an audience and recommend it as an interesting read about the American cultural and social experience from a humoristic and candid voice.